NevadaGram #4 Las Vegas is still slow while Tonopah bounces back. Among the e-mails we’ve received recently was this one from Saskatchewan. Thanks, Carolyn. Is Battle Mountain Truly the Armpit of America? Here’s the article with the bad news from the Sacramento News & Review. The enthusiasts at Viva Las Vegas will send you their free bargains-oriented newsletter for the asking (see below). This list of top buffets is from the most recent edition. Take it as one man’s highly educated opinion. buffet also has to take place in a special Buffet Room. 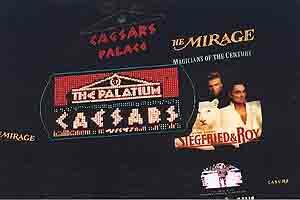 newsletter “Viva Las Vegas”, go here. On my way to Las Vegas in December I paused in Tonopah to visit with Bob Perchetti over coffee at the Silver Queen. Bob is a Tonopah native and businessman, formerly the director of the Convention Center and State Tourism Commissioner. 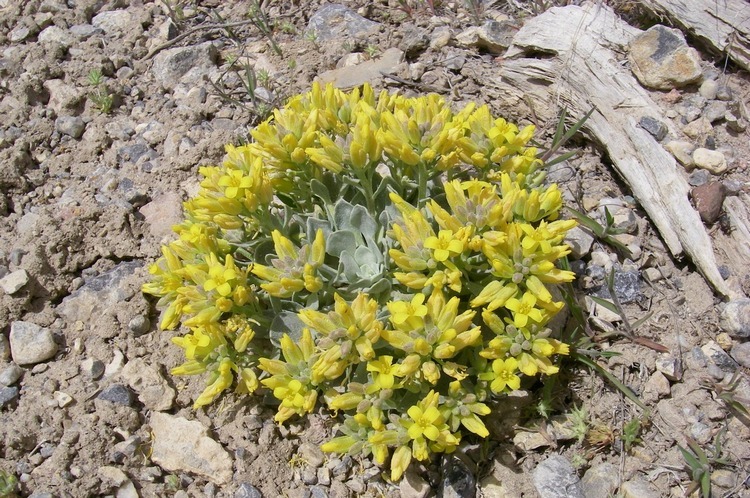 We reminisced for a while about old friends and local characters, which led Bob to recall Melinda Moffit when she owned the Hot Creek Ranch some years back. Bob has hunted chukkar in the steep country around the ranch since he was a lad, and had met Melinda one day as he drove past the hot spring pool and Melinda rose up out of the steam dressed only in tattoos and turquoise jewelry. “What the hell are you doing here?” they both said at once. rustling in the brush, turned, and saw a herd of starving, saucer-eyed ostriches bounding toward them through the sagebrush at a dead run. Utterly flabbergasted for a looong moment, they came to their senses and jumped back into the truck. They ended up giving their sandwiches to the hungry birds while they hunted up more feed. It’s hard to imagine that 20 years ago Tonopah was bursting at the seams with the energy of miners, Air Force personnel and eager entrepreneurs. Tonopah has been in the doldrums for a most of a decade. 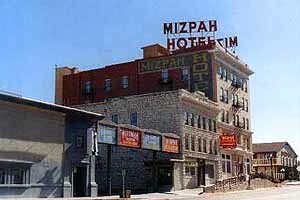 The Mizpah Hotel has been closed since its most recent bankruptcy, and the Station House went under more recently. Both are scheduled to re-open in the spring, the Station House now under the ownership of the great Jim Marsh, Las Vegas automobile dealer and desert entrepreneur extraordinaire. 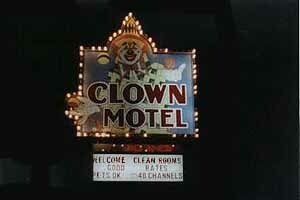 It will be a Ramada Inn affiliate. There are still plenty of excellent lodgings in Tonopah, of course — the Jim Butler, the Best Western, The Clown, the Silver Queen to name a few — but seeing the city’s major properties closed and dark is unmistakable evidence of how slow times have become. If you want crowds, come on Memorial Day weekend for the Spring Festival, Jim Butler Days for barbeque, dance and carnival — but make your room reservations early. On the brighter side, (in addition to the scheduled re-opening of the hotels), the Tonopah Mining Park is in excellent shape and welcoming visitors. Stop by the Central Nevada Museum at the south end of town, and spend a pleasant hour with the exhibits inside and the historic structures outside, relocated here from elsewhere around the county. Also, Nye County has acquired the old Tonopah airport with prospective development now in the planning stage. Currently being bandied about: wind-powered electric generation, huge blades mounted on 17-story towers. . . .
Also, Belmont, once upon a time the Nye County seat, is continuing a modest revival. 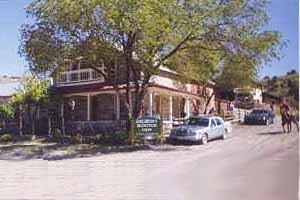 The Belmont Inn Bed & Breakfast, now managed by Judy Camarillo, has been joined by a couple of interesting shops, which amounts to an explosion of enterprise in this quiet relic in the pinyon pines and junipers. The theme of the 18th annual Governor’s Conference on Tourism in Las Vegas last month was how to please the ‘I Want It Now’ generation, but the buzz in the corridors was about how Las Vegas is hurting from the drop in air traffic. Tonopah, Lovelock, Wells and other small communities can die slowly and quietly without notice, but when Las Vegas has a cold the whole state gets the sniffles. Right now Las Vegas has pneumonia. Airline arrivals are down and not rebounding, with international travelers particularly rare. 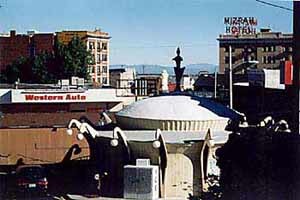 Hotels are running at low occupancy. Budgets are being cut, staffs trimmed, new projects postponed. Casino managers think nostalgically back to the days when 94% occupancy was considered a failure, and by playing every possible ploy it was possible to hit 100%. 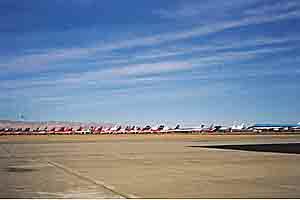 A later jog over into southern California led through Mojave, where dozens of airliners are parked and waiting for passengers to start flying again. I am informed by Virginia Ridgway that the Glory Hole Gift Shop in Goldfield is permanently closed. I feel bad for anyone who did not get to visit the store when Virginia was running it. 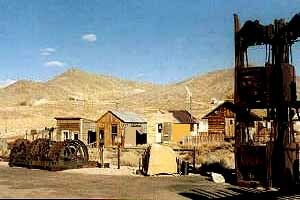 She and Tex Rickard are the best friends Goldfield ever had, and she would go far out of her way to help visitors enjoy the wonderful old city. One day when I rolled into town with my son John, then 13, she gave us a historical tour around town for his benefit. We cruised the graveled streets in an aging Lincoln stretch limousine she had bought from Jim Marsh — neither John or I will ever forget that delightful afternoon. Thanks for everything you’ve given so generously, Virginia!